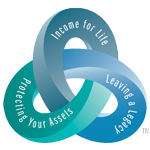 " It is our purpose to create financial peace of mind for our clients through trusting, authentic relationships. We will educate our clients in order for them to make the most informed decisions regarding their future financial security. We value trust, intergrity, and family and this is how we run our practice." Imagine being confident that your income will last throughout your retirement years—despite changes in the economy or how long you live. Northwestern Mutual’s retirement income planning process is designed to help provide you with a steady income stream for as long as you live.